I ask for information to those who had experience with distribution belt failures. breakage of the timing belt is more common, caused by: wear / time / km etc. Or is it caused more frequently by the service belt, than by breaking itself it coils on the main belt causing it to break? The 20vt cambelt is pretty strong, it's more common for the aux belt to fail and the remains to get wound around the crank pulley and into the cambelt causing it to fail. 1 or 2 guys did make pulley guards to stop the aux belt failure interfering with the cambelt. I left my cambelt for 10 years but it had only done about 30K miles. It still looked fine but had stretched to the point of being a little loose, so it really did need changed by that time. For 16v owners, however, the cam belt is a lot more fragile... it's quite happy to break on its own, without troubling the aux belts! 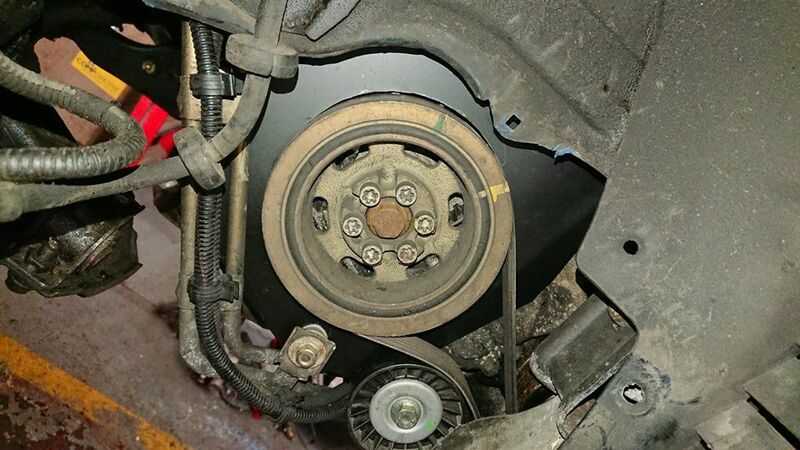 I had seen somewhere, the pulley to protect the cambelt, any of you know where you can buy? Another question, to change the belts of services and need to move the engine? Does anyone know where to find a guard pulley? I read that on fitting the main belt it has 150% of the strength required and at end of the belt change duration/mileage/cycles it is still at circa 100%. One Coupe mechanic told me he has never seen the main belt go on it's own on the 20v turbo; it is as we know the aux belt/tensioners etc that usually take out the main. I have taken the main belt up to 8+ years and circa 40k+ miles (wouldn't recommend it though) but do the aux belts and tensioners every 3-4 years. JBT http://www.midlandscarservicing.co.uk/ had a pulley manufactured with a guard I seem to remember. Traffic light Grand Prix's and banging the car off the limiter are a no-no for the Coupe and it's belts IMO especially so if running big power increases. I have known the pulley guards not to work and still allow an aux belt to jump and be caught by the cam belt, one last year and another big bhp build in Germany so I've copied Flea's design, new batch being made from stainless. I would be very interested in the coverage shown in photos, bhp and a user who lives in germany? can you please give me some other information? I'd like to have a protection like the one in the picture? I'll send you a pm after I have received the guards, we can chat further then. I wanted to ask Mr. Joe information about the timing belt guards.